Built for adventure, built for fun. Check out the new 2019 Toyota Corolla Hatchback! The Clermont Toyota Corolla has always been a favorite of our customers for its fuel economy and sporty feel, but this isn’t that. This is something entirely new. 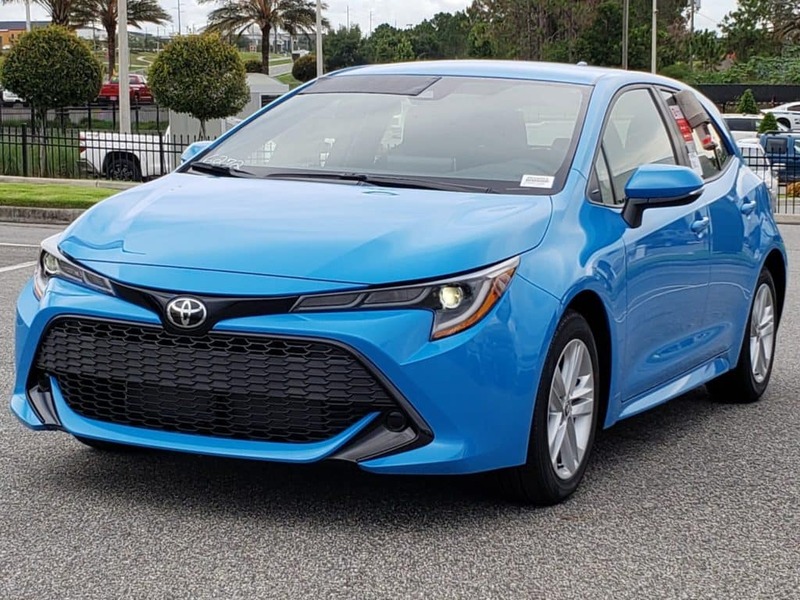 From Toyota of Clermont, we introduce to you the 2019 Toyota Corolla Hatchback! This hatchback sedan is styled with clean lines, engineered for sporty drives, and built for fun adventure. 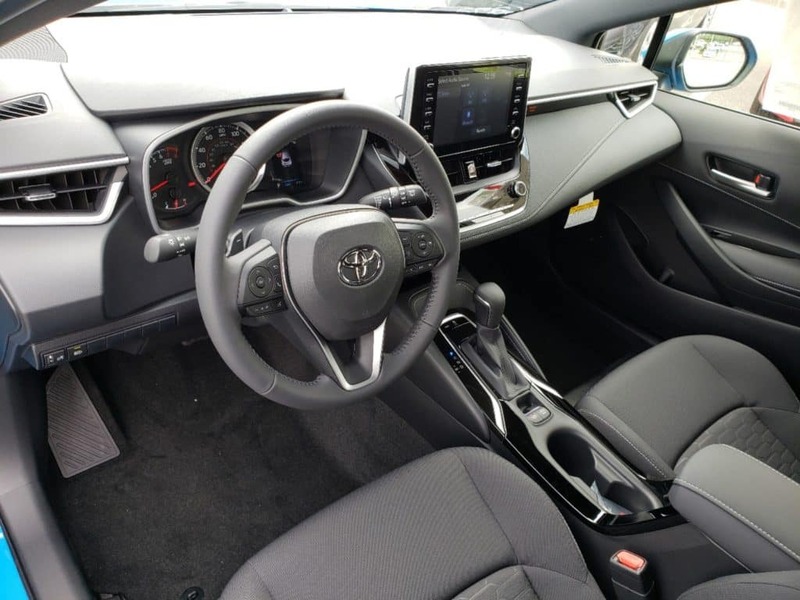 This all new vehicle is sitting on our lot at Toyota of Clermont right now and we have all the details you need before getting in the driver’s seat! A new 2.0L Dynamic Force Engine with Dynamic Shift Constant Variable Transmission (CVT). Hatchback design that draws inspiration from the Toyota Corolla iM and creates something entirely new. New Entune 3.0 integrated app suite and Toyota Safety Sense P technology for convenience and protection on the road. A 2.0L Dynamic Force 4-cylinder engine that outputs 168 hp at 6600 rpm and 155 lb./ft. of torque. Available in both Intelligent Manual Transmission (iMT) and Dynamic-Shift CVT automatic transmissions. Macpherson strut front and trailing-wishbone rear suspension for a responsive and dynamic driving feel. Three driving modes including Normal, ECO, and Sport. Included paddle shifters for an added sporty experience. Vehicle speed-sensing Electric Power Steering. All new front grille design with LED reflector headlights and daytime running lights with automatic on/off. Optional integrated LED fog lights. 16-inch alloy wheels on the SE trim level and 18-inch alloy wheels on the XSE trim level. Chrome rear diffuser and surround front grille. Fabric sport trimmed heated seats available on the SE trim level and leather-trimmed with fabric inserts available on the XSE trim level. Entune 3.0 Audio with an integrated app suite, six speakers, 8-inch touch screen interface, Scout GPS Link, Siri Eyes Free, Apple CarPlay, Amazon Alexa Compatibility, and much more! Optional Qi wireless charging, two USB 2.0 charging ports, and one 12V auxiliary power outlet. A 4.2-inch Multi-Information Display (MID) in the SE trim level and a 7-inch MID in the XSE trim model. Smart Key System with push-to-start ignition. Available Remote Connect for control of the Clermont Toyota Corolla Hatchback from your Apple Watch or Android smartwatch. Drivers can use touch and voice commands to find, lock and unlock, and start the engine of this tech savvy Toyota hatchback. Seven airbags throughout the interior of the Toyota Corolla Hatchback. Star Safety System that includes features like Enhanced Vehicle Stability Control, Traction Control, 4-wheel Anti-lock Brake System, Electronic Brake-force Distribution, Brake Assist, and Smart Stop Technology. LATCH for safer car seat securing. Safety Connect that includes Emergency Assistance, Stolen Vehicle Locator, Roadside Assistance, and Automatic Collision Notification. Toyota Safety Sense with features like Pre-Collision System with Pedestrian Detection, cyclist detection and better low-light capability, Lane Tracing Assist, Lane Departure Alert with Steering Assist, Road Edge Detection, Automatic High Beams, Road Sign Assist, and Dynamic Radar Cruise Control. If you’re looking for fun and excitement from your next ride, then come test drive the all new 2019 Toyota Corolla Hatchback! Visit us at Toyota of Clermont and we’ll walk you through the amazing features of this vehicle and get you driving one home today. Find us at 16851 State Road 50, just off the Florida Turnpike. Call us at (352) 404 – 7000 to set up an appointment or ask about our current specials! 0 comment(s) so far on Built for adventure, built for fun. Check out the new 2019 Toyota Corolla Hatchback!